I was surprised and delighted to see that Rick Steves was on the cover of the New York Times magazine's Voyages issue. “You know,” the driver said finally, “you’re not very different than you are on your show.” This was correct. The driver was referring to Steves’s long-running, widely syndicated, family-friendly public-television travel series, “Rick Steves’ Europe,” on which Steves is a joyful and jaunty host, all eager-beaver smiles and expressive head tilts. With a backpack over one shoulder and a hand tucked into his pocket, Steves gushes poetically about England’s Lake District (“a lush land steeped in a rich brew of history, culture and nature”) and Erfurt, Germany (“this half-timbered medieval town with a shallow river gurgling through its center”) and Istanbul (“this sprawling metropolis on the Bosporus”) and Lisbon (“like San Francisco, but older and grittier and less expensive”). He reclines jauntily atop the cliffs of Dover and is vigorously scrubbed in a Turkish bath. The show has aired now for nearly 20 years, and in that time, among travelers, Steves has established himself as one of the legendary PBS superdorks — right there in the pantheon with Mr. Rogers, Bob Ross and Big Bird. The article actually underestimated how long Rick's show has been on the air. I grew up watching "Travels In Europe" back in 1991. And you can tune in and watch Rick visit the same places 23 years later. It's pretty remarkable. Technology has changed everything during Rick's career - we've gone from no mobile phones and having to carry all your tickets in hardcopy form in the late 80s early 90s, being only able to arrange flights with travel agents or travel agencies, to today where you can book a hotel literally instantly on your phone or tablet - but Rick and the wonderful places he visits are a constant. “carbonates your experience” and “rearranges your cultural furniture.” Like sealed windows on a hot day, a nation’s borders can be stultifying. Steves wants to crack them open, to let humanity’s breezes circulate. The more rootedly American you are, the more Rick Steves wants this for you. If you have never had a passport, if you are afraid of the world, if your family would prefer to vacation exclusively at Walt Disney World, if you worry that foreigners are rude and predatory and prone to violence or at least that their food will give you diarrhea, then Steves wants you — especially you — to go to Europe. Then he wants you to go beyond. I highly recommend reading the profile - and then watching one of Rick's shows (most are on Hulu), reading a guidebook or his website, and finding some adventure inspiration. I actually have not read very much of his stuff but, I regard him as the ultimate resource. I used many of his easy-to-translation books while traveling. Thanks for the poke - I will see what he has loaded up on Hulu. Is Rick Steves the American version of Michael Palin? 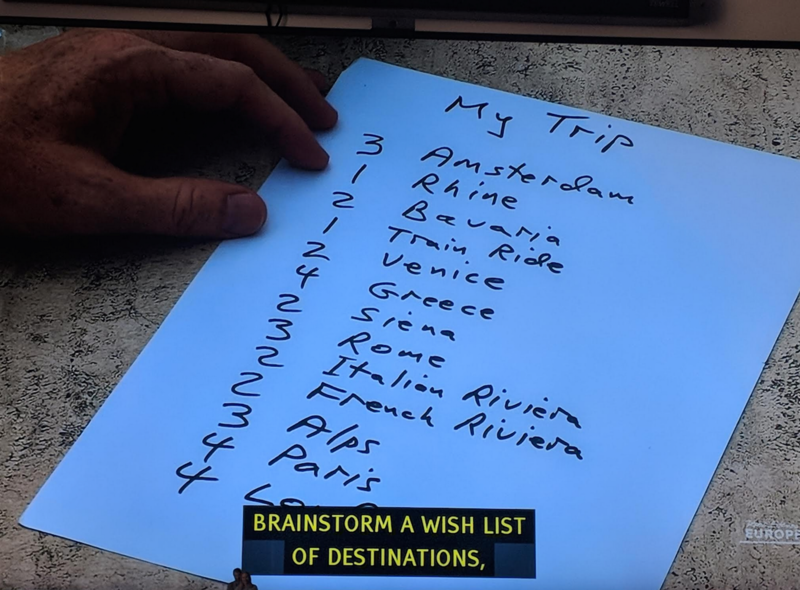 Is Rick Steves the American version ofMichael Palin? Rick Steves television programs were broadcast on PBS, the federally-funded television network in the USA. He’s quite knowledgeable and we’ve had vacations planned with the help of his advice. I believe Michael Palin’s humor may be a differentiator, but I think you’d enjoy Rick Steves. Were you a big fan of Around the World in 80 days? Travel with Rick Steves plays on a local public radio station just in time for me to listen as I drive home from a weekly volunteer stint in a National Wildlife Refuge. I find the conversations to be very interesting.